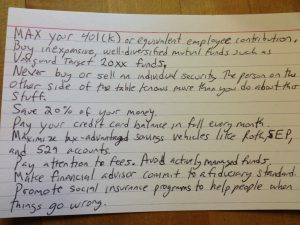 I find personal finance can be a difficult topic to get a solid grasp on, especially since everyone is trying to make a buck with their own personal finance blog. Below are resources that I’ve found to be trustworthy, thoughtful and valuable starting points for gaining a broad understanding — but also the /r/personalfinance wiki on reddit (especially “basic financial advice everyone should follow“) and bogleheads.org are also incredible resources if you need concise crowdsourced advice. The following items are, in my opinion, great resources for get started with educating yourself about personal finance. If you have an hour, read this short book. For years I’ve thought about an eleemosynary project to help today’s young people invest for retirement because, frankly, there’s still hope for them, unlike for most of their Boomer parents. All they’ll have to do is to put away 15% of their salaries into a low-cost target fund or a simple three-fund index allocation for 30 to 40 years. Which is pretty much the same as saying that if someone exercises and eats a lot less, he’ll lose 30 pounds. Simple, but not easy. Not easy because unless the millennials learn a small amount about finance, they’ll fall victim to the Five Horsemen of Personal Finance Apocalypse: failure to save, ignorance of financial theory, unawareness of financial history, dysfunctional psychology, and the rapacity of the investment industry. Since this is a booklet, suitable for reading on a Kindle, computer monitor, or mobile device, and will take only an hour or two to read, it’s not a complete solution. It’s a roadmap, a pointer in the right direction. The booklet is available for free in acrobat, mobi, and Kindle formats. Next, see how many of these things you’re doing and then evaluate why or why not. 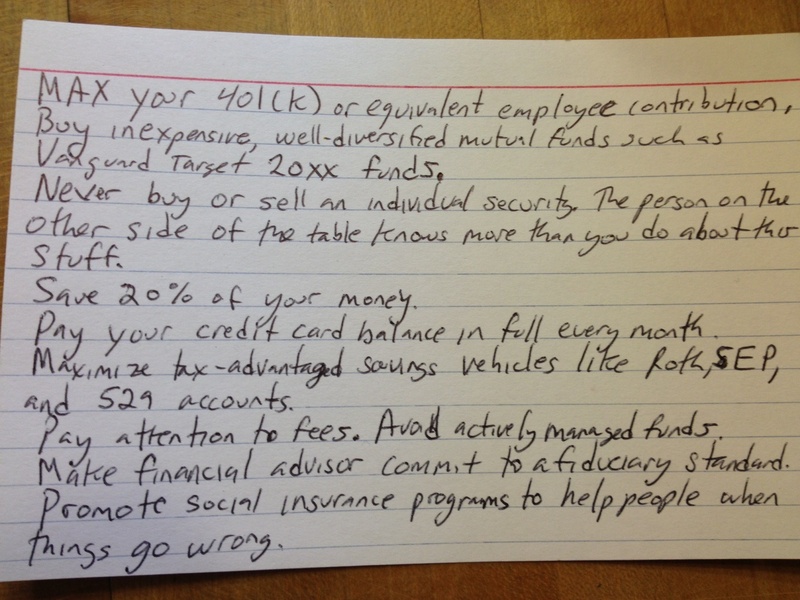 Alex M commented on my last post: What *is* this simple free best personal finance advice that fits on a 3×5 card? It’s kind of a tease to say it’s so easy and then not go ahead and spell it out in twenty seconds. bogleheads.org The Bogleheads® emphasize starting early, living below one’s means, regular saving, broad diversification, simplicity, and sticking to one’s investment plan regardless of market conditions. This site is composed of two primary resources: our Wiki and our Forum. Efficient Frontier – William J. Bernstein’s homepage with links to all of his books, newsletters, reading list and more. Getting Going Series – Columnist Jonathan Clements offers an archive of articles from his Getting Going Sunday series on finding the right funds, building a portfolio, managing retirement and investing in index funds.